Everything you need to help your struggling reader. This is what made the difference for our dyslexic son. The year he used these materials was the year he learned to read fluently. Having struggling readers is hard! We’ve been there. One of our sons was so dyslexic that he didn’t learn to read until he was eleven. It’s tough! Listen, though, that same son is heading to college on an academic scholarship. There’s hope! Our son would be the first to tell you that the materials written by Dianne Craft made more difference than anything else we did. We are so happy that Dianne is allowing us to provide them for you! The Reading Package contains what you need to have for a home-based program that will unblock the Learning Gates (eye-tracking, auditory processing, visual/motor processing, and focus/attention) in your child, then teach them reading, spelling, and writing at the same time. This made a huge difference for our son! This package includes the Daily Lesson Plan that Dianne Craft uses with struggling readers, from first through eighth grade. These methods work with Dyslexia better than any other program I have ever heard of! We had a bright, hard-working child who just had to work too hard to learn. Other programs have intensive phonics, but don’t deal with the root causes of reading problems like this program does. 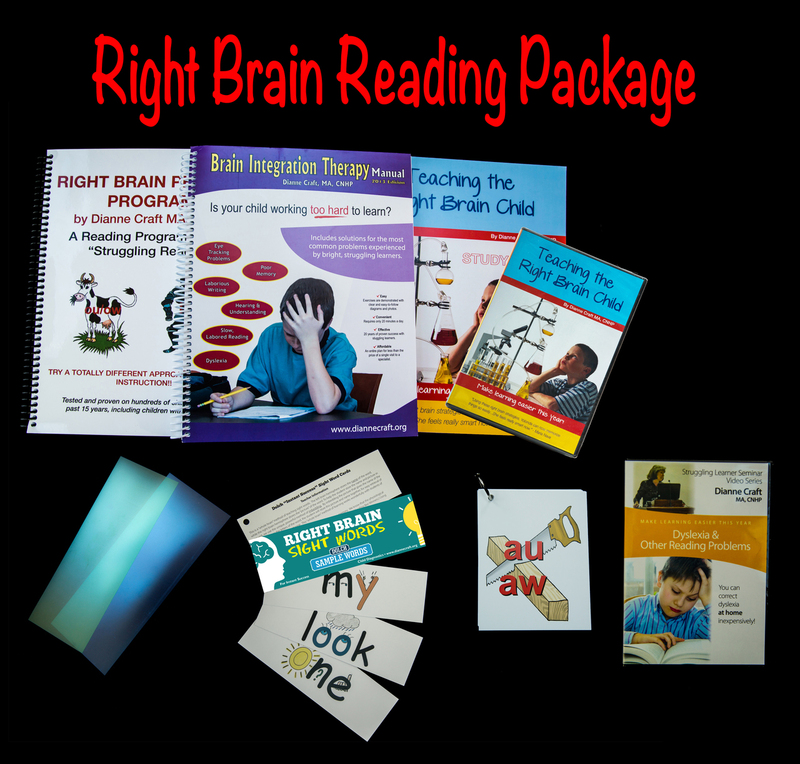 Dianne created this Specialized Reading method, which uses Brain Integration Therapy and weekly Brain Training to CORRECT the problems struggling readers have in communicating between their right and left brain. Processing problems are often reduced by 80% while Auditory Processing problems are bypassed by using Right Brain Phonics. I don’t know about you, but we used LOTS of phonics programs and nothing worked! You and your child need something that works! Right Brain Phonics has no memorizing and no writing, but employs the child’s ability to remember pictures to store and call up phonics sounds. You will not believe the difference this program makes just by changing the way this is handled. Pictures and colors arranged in the right way are incredibly more effective than the usual flash cards. This step by step daily Remedial Reading Session takes about 45-55 minutes a day (that’s all! ), and includes all four of the reading components without tears or frustration. It’s exactly the method Dianne uses herself and she often sees two years growth in reading ability in just one year. You can achieve the same thing, using this in your one-on-one tutoring session with your child. You can become your child’s own Resource Room teacher and tutor without any formal training. It is all laid out for you, step by step. The reason these kids struggle with reading in the first place is because the READING PROCESSES have not become automatic yet. They have to work too hard just to track or bring the sound of a letter or word from one hemisphere to the other where they are seeing the phoneme. 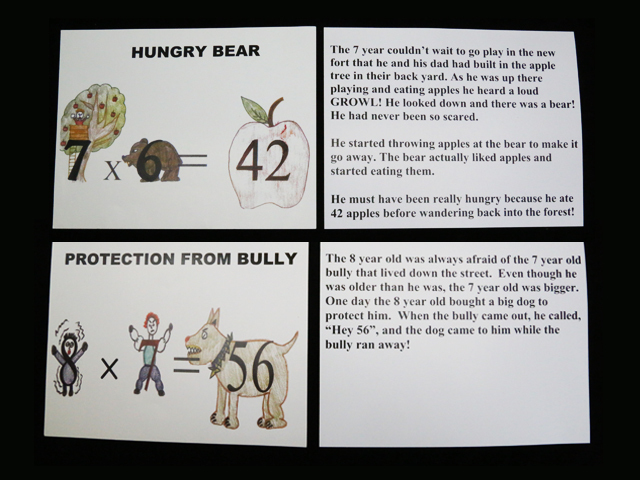 Other kids can do this automatically, so they can learn new words more easily and focus on the comprehension, too. The daily midline exercises and weekly Brain Trainings help to make these processes automatic. They CORRECT the processing difficulties that make this all so hard! This corrective technique creates connections between the short term memory and long and reduce processing problems drastically. Once these processing problems are corrected, these students can learn using more ordinary methods. Seriously, the Brain Integration Therapy Manual is a life-saver! We used it every school day for a year and that’s the year Sam finally learned to read fluently. I cried with joy! Most phonics programs just assume that the student can easily remember the connection between the sounds and the letters. Our dyslexic kids just can’t! Right Brained Phonics EMBEDS the phonemes in visual cues that help a child like this remember the sounds. This is like cutting handholds on the mountain they’re climbing. There’s not a bunch of rules. There’s no writing wrapped up in the phonics. They don’t have to memorize a pile of things. Right-Brained Phonics uses their strengths to make it so much easier to learn to read! These wonderful cards EMBED the phoneme on the cue picture. I could NOT BELIEVE the difference that made. Oh. My. Word. The kid who couldn’t remember from one day to the next got it down cold. I thought I could make these, but this made it so, so, so much easier. They’re there. They’re right. They’re a huge help. Oh dear. Sight words. It is so hard to teach a child like this crazy weird words like of, what, could, many, and here. Those are some of the most common words in the English language, though! These cards make it a piece of cake to learn AND spell them! This is a “Teacher Training” DVD. It will show you how to use these Right Brain teaching strategies for Phonics/Reading, Sight Words, Vocabulary, Spelling and Math. It teaches on the responsibilities of the Right Brain and why these methods work so well for children with Auditory Processing Dysfunctions. Have your child watch it with you. Many times parents say their child/teen feels so empowered by watching the DVD because they see how smart they really are! This DVD will help you become an “Expert in Dyslexia” Probably one of the most important teachings you will watch if you are working with a struggling reader. Learn exactly where the “disconnect” in the brain is that causes the reading, writing and auditory reversals and word memory problems. More importantly you’ll learn how you can “re-connect” these vital transmissions using simple daily midline exercises and Body/Brain Trainings. These can be done right during the daily reading session, in the classroom or at home. At the same time, in this “2 step” approach to Dyslexia and reading problems (Step 1–midline therapy to re-connect, and Step 2— Right Brain Teaching Strategies) you will learn how to use an entirely different approach to teaching phonics and sight words, using right brain “hooks” on the auditory material that was previously impossible for them to retain. 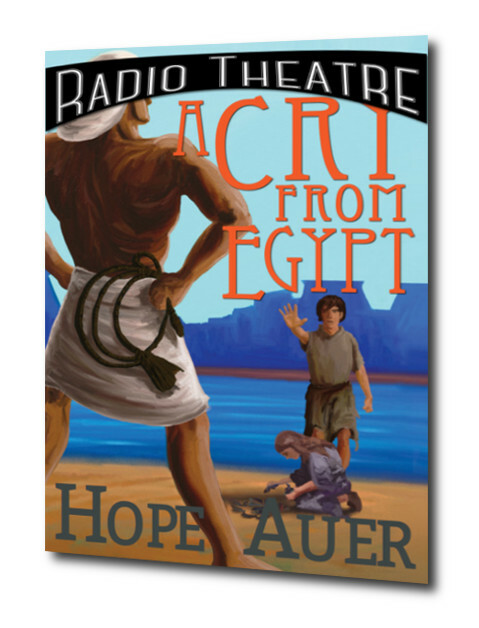 You will be thrilled as you watch them begin reading! As a special education teacher, Dyslexia and reading problems are what Dianne Craft worked with the most. She came up with her own method and you will find that you can deal with dyslexia at in the classroom or at home inexpensively. Includes the Daily Lesson Reading Plans she used in her Resource Room to achieve a two year growth in reading in one year. If your child still reverses letters or words when reading, reads very slowly or choppily, or even if he just rubs his eyes after reading, or avoids it all costs, these Blue and Green colored transparencies with temporarily take much of the stress off of their visual system while reading. Kids like these transparencies. Even college students do. They won’t need them forever if you are faithful to do the Brain Integration Therapy Visual exercises and Brain Training and if you give DHA (fish oil) to feed the rods (light/dark adapters) in the retina of their eyes.